The Île d’If is located 20 minutes boat-ride from Marseille. 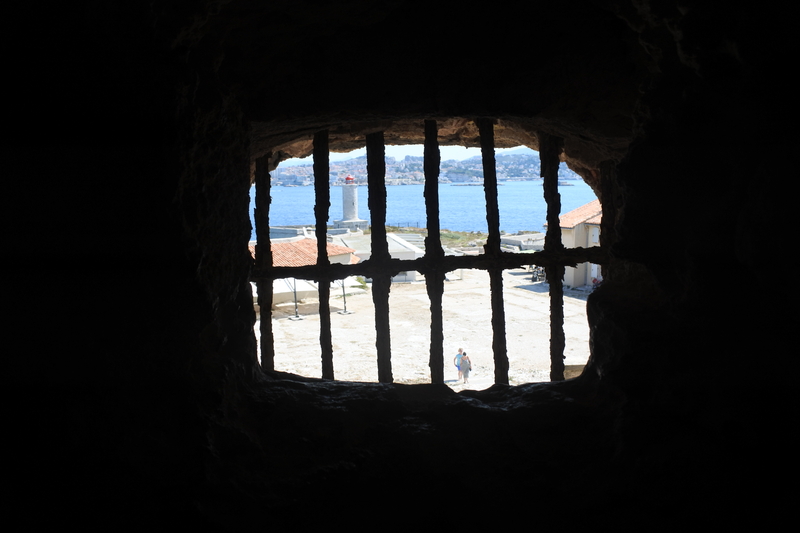 Once a fort, the Château d’If operated as a political prison during the late 19th Century. Yet, the site is best known as the site of one of the most famous fictional prison breaks (after Papillon – which while not ‘fictional’ relies heavily on fiction in Charrière’s retelling) in French literature – that of Edmond Dantès. However, before Dumas’ Comte de Monte Cristo comes another story, equally tied to the mythology of the island. The tale of Ganda, the rhino. Alfonso de Albuquerque, the Portuguese second viceroy of India, from 1506, with superior ships, secured control of the Indian Ocean over-against the Ottomans for the next 100 years. Portugal then extends its trade seeking the fabled spice islands in the Moluccas. In India, Albuquerque wanted to build a fort in Dui, Gujarat, and to negotiate this in 1514 sent envoys with gifts to Sultan Muzafar II, ruler of Cambay, who refuses the request, in turn sending, as is the custom, a gift for Albuquerque to take to the Portuguese King. This gift was a Gujarati Rhinoceros named Ganda. He was shipped back to Portugal via Madagascar, St Helena. In 1516 the Portuguese King decides to send him on to the Pope in the Vatican City. Having travelled all the way to Europe, Ganda never makes it to the Vatican. Exhibited for a time at the Château d’If, the onwards ship to Rome floundered near Porto Venere, and Ganda, shackled to the deck after having circumnavigated Africa, sadly drowned. Yet, the story does not exactly end there. In 1515 the Nuremberg printmaker Albrecht Dürer made a woodcut of this Rhino, but without having seen the animal, working from sketches. A print of the woodcut is now exhibited at the Château d’If and the story of the rhino is juxtaposed with that of Edmond Dantès – the fictional character and mythical animal producing a double fiction which obscures the history of the island as real carceral space. For me the reproduction of the woodcut as print but also museum logo emblazoned on t-shirts and other gift shop items calls to mind the episode in A la Recherche du temps perdu involving Marcel’s lamentation of his grandmother’s extensive and ridiculous attempt to furnish him with tasteful ‘representations’ of famous monuments but with a further parodic twist. On the one hand, the rhino print is the most tasteful of artistic representations, the artist having never actually come into contact with the real, live rhino, only the sketches made by others. On the other hand, the banal vulgarity that Proust’s grandmother is so keen to circumvent, comes back in full force on the Île d’If where Dürer’s simple woodcut is reproduced ad nauseum as souvenir logo. Likewise, the representation of Edmond Dantès as celebrity inmate enacts a similar yet more disconcerting parody. Almost the entire ground level of the chateau is taken up with his story alongside that of his creator, Dumas. Through a small hole peeping into a lower level cell, it is possible to make out a mini television screen showing scenes on a loop from the French TV adaptation of Dumas’ novel starring Gerard Depardieu as the Count. Perhaps the least convincing of all the actors to portray Dantès, the rhinocerous-like Depardieu playing a prisoner near-starved in total darkness for fourteen years neatly shrunk and contained within the space of the miniature television set perfectly embodies the deliberate inauthenticity of the island’s carceral myths. Representation of the real prisoners confined on the island is limited to a series of unimaginative and instantly forgettable placards predominantly on the cramped upper gallery of the chateau. The Château d’If, it is worth noting briefly, had held 300 of those imprisoned by Louis Boneparte after the 1851 coup and even more after Marseilles rose up alongside Paris and the Commune of 1871– some of those prisoners were subsequently executed and others deported to New Caledonia.